I haven’t written for a while in my blog and apologize for that to my avid readers. Instead of my stats diminishing, they have increased. I guess I have ample material with enough keyword searches on the subject on Kazakhstan that I will continue to get “hits” whether I write much or not. As an earlier blog indicated, I thought I was finally returning to Astana but it didn’t work out. Hurricane Sandy had something to do with my passport being delayed so that I missed my first flight. My passport was stuck or held up for over a week in New York. When I was ready to take my second, rescheduled flight once I DID get my passport back, the visa read: “NO RIGHT TO WORK.” So, the whole point of my going to Astana was to teach English and I would have had to do it for FREE with that kind of bureaucratic stamp in my passport. Truth be told, I have felt like a “slave” in the past when I taught at a “westernized” university in Almaty. Well, it wasn’t that bad, but as a professional I was not paid well and treated disrespectfully. But I know I wasn’t singled out as an American, those in “control” of teachers did the same to my colleagues, their own Kazakh teachers. I am glad to read what a British teaching colleague is doing about human trafficking in Astana. He has become very active in the movement and I KNOW he will leave a lasting impression on many he leaves behind. The following is how David sees himself fighting the good fight against human trafficking in Kazakhstan. May his tribe increase so once he does leave Kazakhstan, there will be many more who follow in his footsteps combating human trafficking. “It has long been my custom to give away clothes, etc when leaving any country I have been working in (Kz is the 10th I lived & worked in) to this end on my arrival in Astana, I searched for & found a charitable organization here in Astana and organized a clothes collection to pass on to them. The end of winter gave me the opportunity to de-clutter my colleagues’ wardrobe (ok, closet for Americans) and help those in need! I have been involved in volunteering over many years both when I was younger in the UK with social causes (Adult Literacy, Youth work among other areas) and in more recent years in sport as a coach/referee (especially in fencing). I had never been involved in the area of trafficking & in all honesty knew little about it when I first became involved as I have begun to learn much more about the area I realize what a horrific crime against humanity it is & I should do what little I can. The organization I became involved in is the International Organisation for Migration which deals with migration & human trafficking around the world. I visited the offices here in Astana & they are in need of clothes and/or domestic equipment. The majority of cases in Central Asia are concerned with labour trafficking & the majority of victims are men which is very different from the overall global picture! When someone is rescued from conditions of servitude/slavery they usually have nothing but the clothes they are wearing. IOM operates hostels for escaped/rescued victims around the country (Astana, Kokshetau, Petropavlosk & Almaty) which I have visited and can tell you, at first hand, how welcome our donations have been. You should not compare the donation of clothes to victims here in Kz with giving clothes to a high street charity shop in the UK. All donations go directly to help victims (i.e. are NOT sold through a shop) so help to change lives & ‘re-humanise’ victims recovering from a traumatic situation. Even the donation of an old handbag will help give a victim some sense of self-worth as they have something that is ‘theirs’.The other area I have focused on is awareness raising at Nazarbayev University where I work as an English teacher. The students at NU are frequently told they are ‘the future leaders’ of the country and thus are the sort of people one needs to educate! A series of film shows, seminars, lectures & other activities such as card making/bake sales have taken place over the last 18 months which has helped to make the students (& staff!) of NU much more aware of this issue than they were. NU has donated domestic equipment which had been written off (eg mattresses, towels, etc). Some of the students have responded magnificently as you can see from this video made after a student-organised run in aid of victims earlier in 2012.It is difficult to have more direct involvement as there is an obvious language barrier as well as the need for security in the healing process which is part of the 3 Rs approach (Rescue, Rehabilitation & Re-intgration). 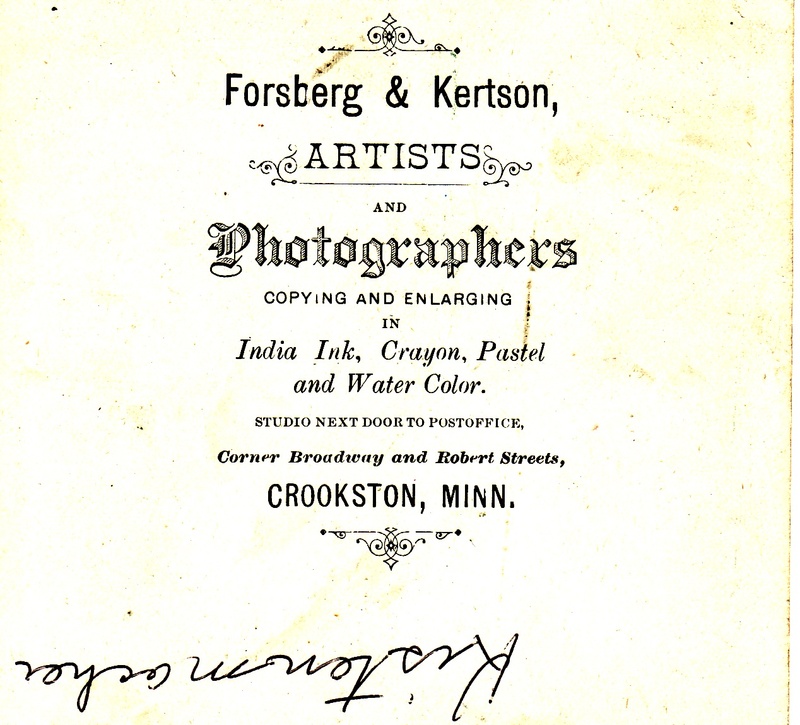 I’ve been scanning hundreds of old photographs from my hometown in Minnesota. What was written on some of the postcards or back of photos is very revealing of that era. Some are short notes that have the brevity of a Twitter message. 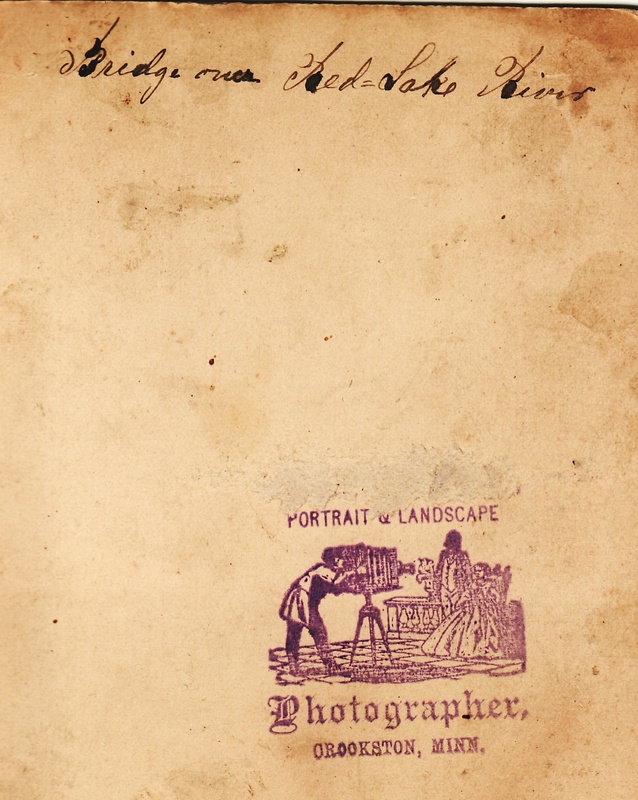 What some of the photographers wanted to be known for is also interesting, stamped boldly on the back. I have three scans that I did that I’ll show in this blog as I wonder how much was photographed of Kazakhstan. I know that Max Penson was a Belorussian Jew (1893-1959) who went to Uzbekistan to do B&W photos of what was supposedly the “happy” Uzbeks. I think he caught on that not all things were rosy as he was instructed to depict through his camera. His artistry is amazing nevertheless and I’m glad someone has taken the time to scan many of his photos. Google his name to find them. Finally, I wonder how much of Kazakhstan was photographed. I know that I scanned LOTS of antique photos while I was teaching in Ukraine from my students’ family albums. I’m thinking that there were hardly any happy pictures to show of Kazakhstan when one third of the country was under the gulag penal system in the 1950s and 1960s. Political dissenters were sent to the Karlag in the Karaganda area not far from the capital city of Astana which used to be named Akmola and then another Russian name before it took on Astana. Watch, I bet “Astana” is a place holder name for what it will probably be changed to…the current president’s name of the country of Kazakhstan. You got that bit of news free here on this blog. 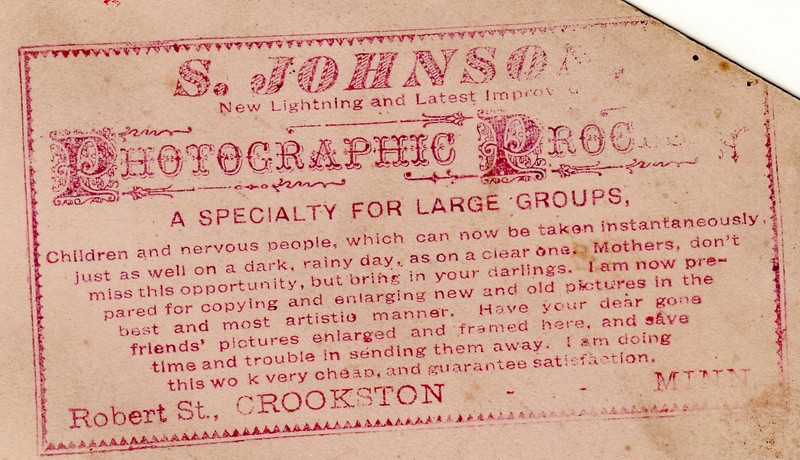 Notice the advertisement on the S. Johnson stamp about this photographer is able to take shots at children and nervous people. All my bags are packed, I’m ready to go to Kazakhstan…seems like a familiar music refrain for me with all the travels I’ve done living 15 years outside of the U.S. Many lists and much has been done, but I am glad that I have a little time to write something before I head out leaving on a jet plane. And yes, I DO know when I’ll be back again. Happy trails to me…until we meet again. Last night I gave a talk about my Minnesota hometown to about 40 interested people, mostly older, white haired people. I had 99 slides to get through in 30 minutes. I only got to about the 70th one and then time was up and I asked for questions and comments. I had a few comments during my presentation where I had to cut short an older gentleman who was going on and on (without a microphone). He understood when I talked to him later. He was a older grandpa himself but his grandfather was one of the movers and shakers of my hometown. That would have been 120 years ago. People can make a difference in the lives of others, be they good or bad. There are very good people in the world and there are evil ones. My brother in the big city of Minneapolis was rear ended in his nice new pickup by someone who is evil. There was no police report filed but now this guy claims that my brother cut in in front of him. He is calling on a lawyer to support what he is lying about. There are slimy people in the world. Knowing my brother who is smart and can take care of himself, well this guy should not have purposely “bumped” into this hockey player brother of mine. We just had Halloween and it was simultaneous to a full moon so the weirdos were out in full force. A high school friend of mine said she was in the front room of their house with her daughter and small granddaughters. There was the ring of the doorbell and the littlest granddaughter thought it was yet another trick or treater. They had about 35 treaters instead of the usual 75 kids coming for candy. Instead this little 5 year old girl saw a man in his 20s, who was dressed in camo and had a “Jason” mask on. He also carried a REAL chainsaw and he ripped it on and revved it up. Scared everyone in the house and my friend’s husband watched to see where he went next, he just walked across their front lawn and on down the street. Of course the girls were wild with fear, there are crazies out there…everywhere. There are evil and strange people in the U.S. and in Kazakhstan. Maybe that is why I feel safe to go back in the archives and look up old newspaper articles in the 1870s and 1880s because those people have long passed on. Some have died and were considered good people, others were shrewd, a few made lots of money, while others may have made lots of enemies. But we mostly find out about the GOOD in people from what is documented. Someone who owns an antique store in my hometown said that I could look at what he found of the police records of those men from the 1880s and 1890s who had some kind of run in with the law. I’m eager to do that. As I told my captive audience last night, I will be writing a book about our hometown history and trying to figure out who was friends with whom. There were many good men who started up our town at the turn of the 20th century. That’s why it was a privilege to meet the grandson of the man who was one of the founders of our community. Yes, I hope to write a book about my town with about 200 photos. I look forward to working with Arcadia Publishing in South Carolina because they have about 8,000 titles of small towns printed already. Small town America is vastly diminishing but I think there should be a renewing of these towns because big city life gets complicated especially looking at what is happening in the aftermath of Hurricane Sandy. So, why do I also keep writing about human trafficking issues, especially in Kazakhstan? I care about the people who are trapped in a country I love. The Kazakh people I have worked with, yes, there are some evil people who are caught up in the corrupt system in Kazakhstan, they can’t help themselves. That is why my Master told His followers, “Be wise as serpents and gentle as doves.” I know I live in two world systems simultaneously, there is nothing I can do about it. But I can help free or help those who have come out of trafficked situations. I am an American with freedom and independence on my mind, for everyone including the unborn baby as well as the trafficked victim. The vulnerable and defenseless need outside help. As an educator I try to help by making people aware of the evil that is out in the world. Also, as an educator I want people from my hometown to know about a history that has both good and evil but mostly good. I come from solid roots where I am able to travel half way around the world to help teach English in Kazakhstan. If more people from my hometown know about the power of their ancestors and the energy it took to DO good, then they will take heart to know that whatever evil comes to them…this too shall pass. I know I’m rambling right now, I should be getting ready to pack for my trip to Kazakhstan. What will I witness in changes from when I was there 1 1/2 years ago? Astana is on a fast track to become an important country to reckon with among the developed nations. The Kazakhs are in earnest to be recognized as key players on the world scene. Maybe I have a sense of that spirit being from a small town that used to have a glorious past but is waning in strength and numbers. I can identify, the Kazakhs have an AMAZING history!!! Okay, enough for now. I hope to have photos soon of what I see in Kazakhstan, that is, if I get my passport with visa in time. It was held up in New York due to Hurricane Sandy.